So I appreciate all of Jill’s work teaching people about the safety, nutrition, and speed of pressure cooking. For those of us who aren’t able to attend one of her classes or cooking demonstrations, her DVD is a great chance to watch her in action. In it, she covers all the basics that you need to know as she prepares 14 dishes (including two desserts). The DVD includes a booklet with the complete recipes so that you can easily make the recipes at home. Everything Jill creates looks delicious, particularly the Spiced Red Rice with French Green Lentils and the Garlicky Green Bean Potato Salad, but when I saw her make Herbed Polenta in just minutes, I knew what I would be making. I love polenta and have cooked it in several ways, including in the microwave, but I’ve got to tell you that none of those ways were as easy as making it in the pressure cooker; it came out lump-free without all the stirring that other cooking methods require. I stirred the water as I poured the polenta into the cooker and stirred it again after it was cooked, and it was thick and smooth. After pouring it into two 8-inch pans to cool, I cut it into cubes and toasted them in a non-stick skillet. Jill’s recipe called for fresh herbs, most of which I had in my garden, and the resulting polenta was probably the most flavorful I’ve ever had. While the polenta cubes stayed warm in the oven, I made up a quick sauté of beans, mushrooms, and some baby bok choy from my garden to go on top. Since the polenta is so flavorful, I kept the seasoning in this vegetable and bean sauté very light, allowing the freshness of the ingredients to shine. Make the polenta according to the directions below. 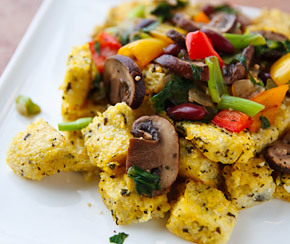 After polenta is firm, cut into cubes and either broil them on an oiled baking sheet or brown them in a non-stick pan, turning after one side is brown. Keep warm until ready to serve. In a large non-stick skillet, sauté the onion for 3-4 minutes, until it softens. Add the garlic, bell pepper, and mushrooms and add a sprinkle of salt. Cook over medium-high heat, stirring, until mushrooms soften. Add the broth, bok choi, beans, and basil, stir well, and cover. Cook for about 5 minutes, until bok choy is wilted but still bright green. Season to taste with salt and pepper, and stir in vinegar. 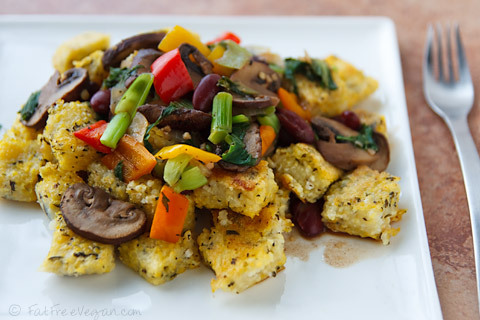 Serve atop polenta cubes, sprinkled with vegan Parmesan, if desired. Jill reserves half the basil and parsley to sprinkle on top of the polenta after cooking, but I stirred it all in at the beginning. She also includes 1 to 2 tablespoons of olive oil but notes that it is optional; I left it out. Bring the water to a boil in the cooker. Stirring, sprinkle the polenta into the water. Add the garlic, salt, bay leaf, half of the basil and parsley, the oregano and rosemary. Lock the lid in place and over high heat bring to high pressure. Immediately lower the heat to maintain pressure for 5 minutes. Remove from heat. Let the pressure come down and release any remaining pressure after 10 minutes. Remove the bay leaf and stir the polenta well. If the polenta seems too thin, simmer while stirring for a few minutes. Sprinkle with remaining herbs and serve as is or pour into pie pans to cool. When cool, cut into slices or brush with oil and pan sauté or grill. 4 weight watchers points per serving. I made this for dinner tonight and it was wonderful. This was my first time cooking polenta. It was so easy. Thanks for the recipe! I have had mixed experiences with polenta in the pressure cooker. I will try again with this technique – clearly my recipe required the polenta to cook for far too long! I am starting a monthly series on my blog to post pressure cooker recipes. I hope you enjoy them and consider sharing them with your readers. Up now, are 20 minute lentils. Next week, I will have a step-by-step risotto and next month I have not yet decided on either a creme brulee or a cold veal roast. Oops! sorry for putting my keyboard in my mouth. i don’t think cold veal roast or creme brulee would work for your readers! Hi Susan… me again! I wanted to let you know that I wrote a detailed article on making polenta in the pressure cooker. I hope you enjoy it! I’m going to give this recipe a try. One question… since you seem to be a big fan of the pressure cooker, why would you use canned beans?? Canned beans are still faster than pressure cooked, so when I’m running short on time (hungry kid demanding to be fed), I use canned. People can always substitute the same amount of home-cooked beans. What kind of pressure cooker do you have? I’m looking to get one and I was confused by the number of choices.